With the last few days of lovely sunshine the tomatoes I toiled over much earlier in the year are finally really ripening. And there's nothing better than plucking one for your lunch - and eating it while it is still warm from basking in the sun. And each time I eat something from my veg patch it reminds me just what a great feeling it is to grow your own. 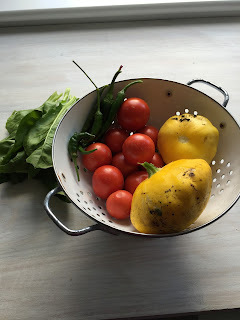 My efforts last Spring were minimal I'm afraid, but I have still had strawberries, summer squash, onions, tomatoes, chillies, spinach, blueberries, peas, apples and potatoes (plus some lovely wild blackberries that were growing in my hedge!) to enjoy. I have some plump pumpkins growing now too - ready for a hearty Autumnal soup methinks. From garden to plate to tummy!!! And I'm going to try and hold on to this feeling all through the winter and into early next year, so I can put a bit more effort into into planting come next March, because growing my own seems to be the healthy option. Not only does it force me to get out in all weathers - bending, stretching, wrestling, digging and - the worst of all gardening jobs - weeding, it also encourages me to eat more plant-based meals and turn my back on the over-packaged and chemically-enhanced products that often now grace the supermarket shelves. If you don't sow, you can't reap! It also encourages my kids to understand where food comes from and eat a variety of plant produce (I have never forgotten when a checkout girl asked me if a parsnip was 'some sort of white carrot'). I know I'll never reach the dizzying heights of my parents - who pretty much eat only fruit and veg from their own garden for the summer months - but that's because gardening also brings with it a real life lesson - you only get out what you put in. Growing your own can save you some money too (which I why I got a blueberry bush!) - and reduce your environmental footprint. 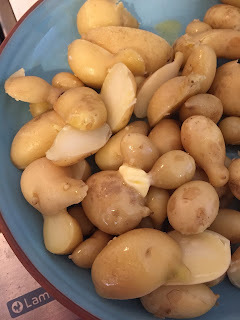 It's also a great way to get grandparents, parents and kids together - my kids love a forage around granddad's veg patch - and being allowed to pick the beans and pull up the spuds to take to the kitchen. While Autumn might not be the ideal time to get into gardening, you can get planning. Decide whereabouts your veg patch will be - you'll need a sunny spot, or if you don't have a suitable area consider 'container gardening'. It'll be another month or so before you can clear and dig over your patch, add in some compost and cover the area to stop weeds from sprouting so that you're all ready for Spring. In the meantime take a look through seed catalogues and see what sort of plants you fancy growing - peas, courgettes and beans are great to start with, and how you will 'propagate' them. You can order potato sets now ready for 'chitting' in January and February if you fancy some spuds. If you don't want to grow from seed, you'll also be able to buy small plants to pot on next year - a more reliable way to a guaranteed harvest - and great if you miss the slot to plant seeds or some of yours don't come up. You might even want to put gardening gloves on your Christmas list (there I said it! You know it's time...). I too remember the joy of picking fresh tomatoes, cucumbers and corn from our backyard garden and relishing the uniquely wonderful tase of fresh-picked food. 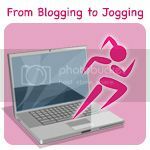 Thank you so much for sharing the value and benefits of 'Growing your own' with us at the Healthy Happy Green and Natural Party Blog Hop. I'm pinning and sharing. You have some very good advice here. You certainly are if you don't sow you can't reap. Mulching is one of the most important things were need to do with the garden for the winter Your blueberries look delicious. 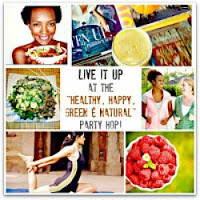 Visiting from Healthy Happy Green & Natural blog hop. Sharing article. Yes, I have a two compost bins on the go - although my new puppy keeps stealing things from it!! !